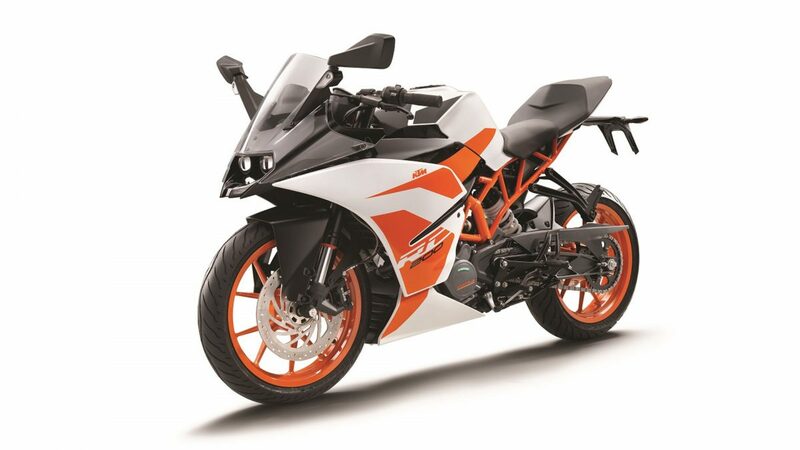 KTM RC 200 is the most gorgeous looking bike in this 200cc segment. If you are a sports bike lover then this bike is an easy choice for you. It packs 199.5cc engine which produces 25 Bhp @ 10000 rpm and 19.2 Nm @ 8000 rpm. The ergonomics are great and the pleasure of the ride and looks make it a head turner. The mileage is also good that is 30-35 kmpl but it does vary according to the riding. 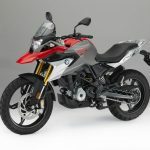 It shares everything with its street sibling Duke 200. 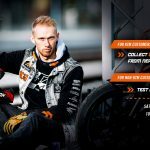 KTM RC 200 for 2017 was just launched a few months back with new white and orange color scheme and BS-IV engine complaint. It made the bike engine more refined and the ride is more smooth than before. 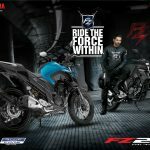 The price of KTM RC 200 in Nepal is NPR 5,39,900. 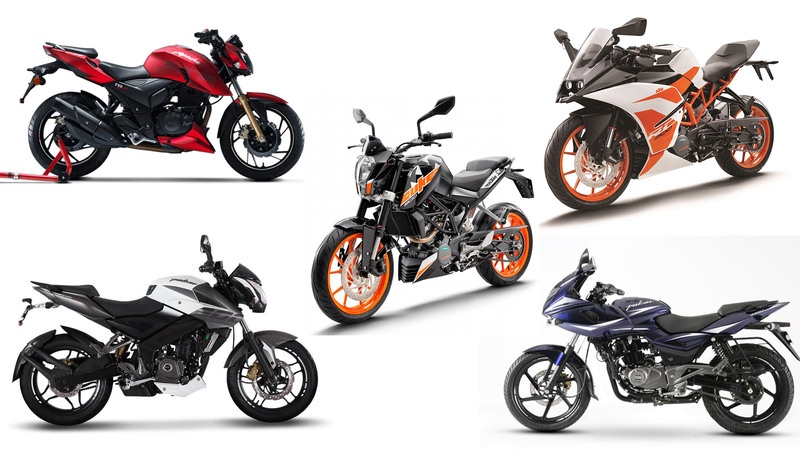 It has a cult of followers now, Bajaj Pulsar 200 is one of the most popular bikes of Nepal. From son to father, they love this ride. 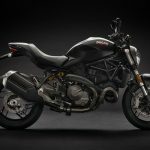 The looks, power, ease of ride and the price is the main thing which made this bike into this list. It has the 220cc engine which produces 20.93 BHP @ 8500 RPM and torque of 18.55 Nm @ 7000 rpm. 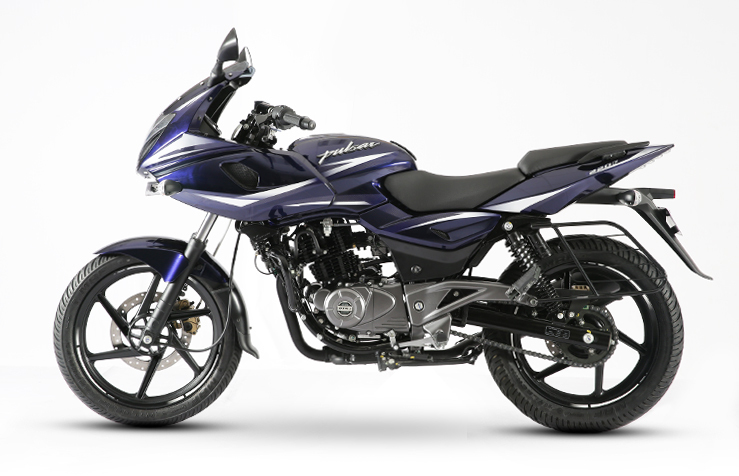 The mileage of Pulsar 220 is 35-40 kmpl which is great considering the power. This bike is available in Nuclear Blue, Laser Black and Dyno Red color options. 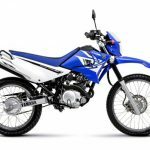 The price of Bajaj Pulsar 220 in Nepal is NPR 2,83,900. TVS is now a new key player in this segment. TVS didn’t have any 200cc motorcycle before and it has thrown everything into Apache RTR 200 4V. This street fighter is powered by 197.75cc of an engine which produces 20.70 bhp @ 9,000 rpm and maximum torque of 18.10 Nm @ 7,000 rpm. 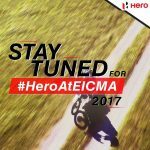 During the launch of the bike it was promised that it will get FI as well as ABS but the case is; it hasn’t been fulfilled yet. 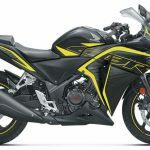 Its competitor Bajaj Pulsar NS 200 has been launched with ABS. So, TVS should look into the launch of FI and ABS very soon to get into the horse again. But the looks, performance and prices are so great, it has made into our list in top 3 position. It is available in 7 color options: Matte Red, Matte Yellow, White, Matte White, Matte Gray, Black and Matte Black. 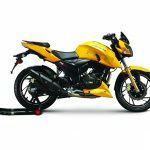 The price of TVS Apache RTR 200 4V in Nepal is NPR 291,900. 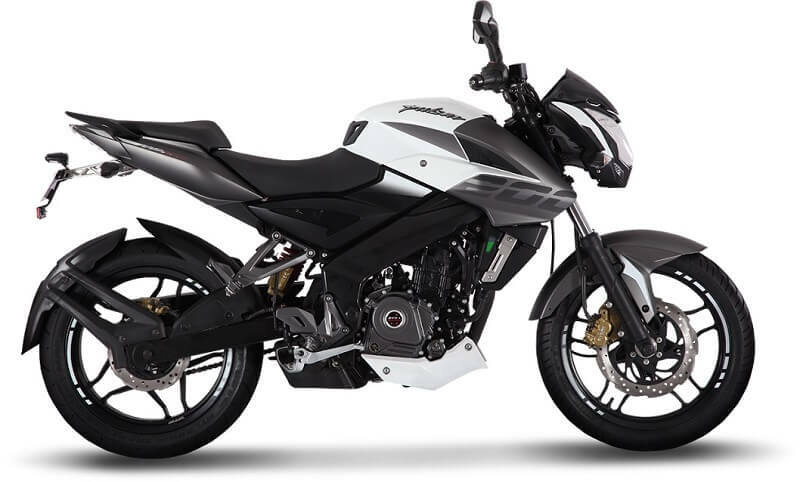 Bajaj Pulsar NS 200 is the most desirable motorcycle looking at its style, muscular body, performance and the new paint job is very nice especially the white one. Bajaj Pulsar NS 200 is powered by 199.5cc which produces 23.20 bhp @ 9,500 rpm and maximum torque of 18.30 Nm @ 8,000 rpm. Recently, ABS version of NS 200 was launched in India and we hope it will arrive here in Nepal too. Only thing FI is now remained in NS 200 to make it a perfect Street Fighter in this category. There are 3 color options available: Graphite Black, Mirage White and Red. 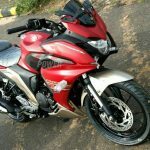 The price of Bajaj Pulsar NS 200 is NPR 2,89,900. 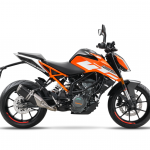 KTM first introduced Duke 200 in 2012 which was obviously a game changer in the motorcycle industry of India. There were other motorcycles but not as light, powerful and raw street looking like it. Everyone loved the way it looks, handles and the power it posses. It was powered by 199.5 cc engine which produces 24.60 bhp @ 10,000 rpm and maximum torque 19.20 Nm @ 8,000 rpm. It is the only bike which produces this much of power in this segment. The kerb weight is just 148 kg so the bike handles excellent. 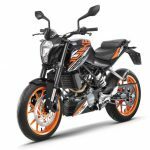 Upgraded 2017 version of KTM Duke 200 is available in Nepal. There are 3 colors available: Orange, White and Black. 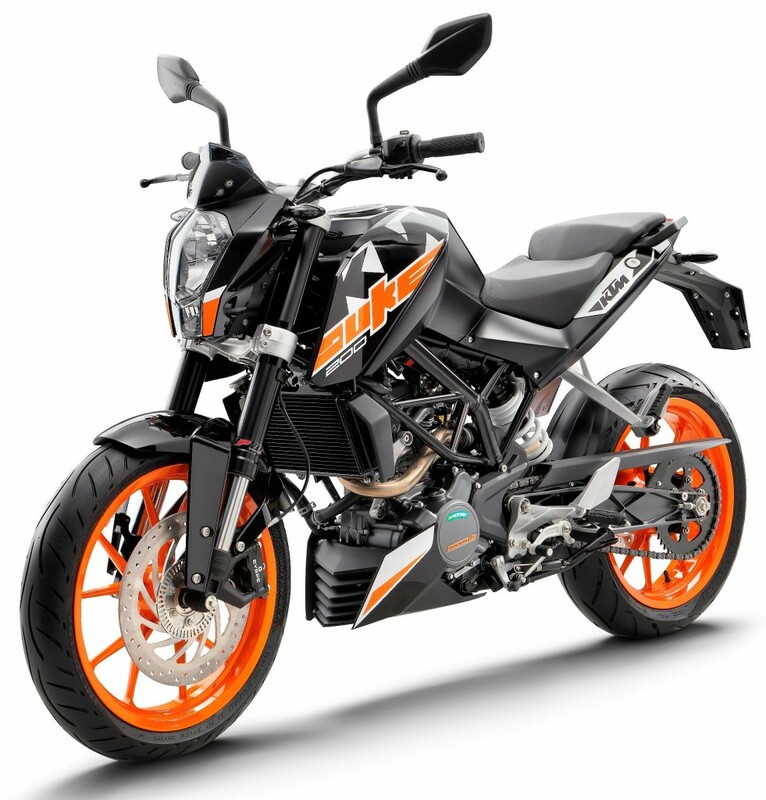 The price of KTM Duke 200 in Nepal is NPR 4,52,900.